A YEAR OF JUBILEE REVIEWS: Brush Love Hair Therapy Wrap Giveaway! Dry, damaged hair can now be saved by Hair Therapy Wrap™. It allows your favorite deep conditioning products to penetrate more deeply than ever. You can use it for your deep conditioning, oil treatments and scalp treatments. Hair that’s damaged by the climate, heat-styling, coloring and bleaching, now has a solution to get more bang for your buck as you reverse damage. The removable, microwaveable, gel heat packs offer cord-free heating that works with the durable insulation for maximized product penetration. A plastic cap seals in product and a layer of washable, terrycloth further insulates. There are 3 sets of gel packs that line the HairTherapyWrap. When heated up, the cap traps the heat providing a thermal treatment for your scalp. This opens up the hair follicle, helping conditioning treatments and oils break through into the scalp while also activating the ingredients to work more effectively. The gel packs take 90 seconds to heat up and will stay hot for up to 30 minutes. If additional heat therapy is necessary, the gel packs can be reheated for up to another 45 seconds, as needed. The HairTherapyWrap works on all hair types and was designed with convenience in mind. There are no cords involved, so no need to sit and wait for your therapy to be completed. 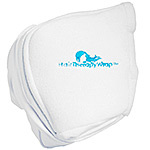 The wrap is also machine washable and can be reused as often as you would like. Have fun with your hair, change up the color, grow it out, chop it off; just remember that conditioning is the most important aspect to keeping a healthy shiny finish! About Hair Therapy Wrap: Michelle Reuven, creator of the HairTherapyWrap, was determined to come up with a way to advance the results of her hot oils and conditioners. Being an active person, Michelle had little time to sit under a hot dryer or go to a salon to defrizz and get her hair back to healthy. Michelle perfected her idea of a bonnet-style hair conditioning wrap catering to the do-it-yourself, at home stylist. The rest is history. Find this and a whole slew of great hair products from Brush love! Romance your hair! Enter to win 1 of 2 Hair Therapy Wraps from Brush Love!! I've done hair masks, but never a wrap! I love that it softens hair! I would love to try this, I need all the help I can get with my hair. My hair is definitely in need of some therapy! I would love to try the hair wrap because I have very thick, waist length hair which is color treated. Because of this, deep conditioning treatments are a must. As a mom of 10, I don't have time to stand in the shower and wait for the conditioner to do it's trick. This would be a Godsend! My hair is dry & damaged, would love to try this! The hair wrap would help boost my deep conditioning and hot oil treatments. I would like to try it because my hair needs all the help it can get! I would love to try the hair wrap for deep conditions as well as oil treatments. My hair is extremely dry with split ends, so this would be awesome for weekly or biweekly treatments. I also love that it allows you to move around and not stay stationed in one area. I need this because my hair is so dried out and in need of some deep conditioning treatments. Would love to try Hair Therapy because my hair is very prone to breaking so hopefully this could help me keep some of my hair. because i love to pamper myself! I would love to try this because my hair is very dry and needs a lot of moisture.I think this hair wrap would also help me on my journey of healthier hair. I would love to tru this to gove my hair the extra boost it needs. i have never tried it before and it looks like it helps with frizziness and might feel good! My hair is pretty damaged and frizzy.